“Bitterwood” is the second novel of James Maxey after his debut novel, “Nobody Gets the Girl”. In a world dominated by dragons, Bitterwood is a legendary figure, a dragon killer. And when “The Ghost Who Kills” as Bitterwood is also known kills Bodiel, the king’s son, the dragon king Albekizan tries to revenge his son’s death by killing every human in his kingdom. But not every dragon sustains his actions and not every dragon shares his vision. The humans will retaliate too and Bitterwood will continue his vengeful mission. The story of the novel has Bitterwood as his key figure, as the novel’s name states, but surprisingly is not centered on this character. I mean that Bant Bitterwood is not the only main character and sometimes he even falls on the second plan. He also is not the typical hero, I don’t think he is a hero at all, he is not driven by noble or altruistic motives and he only seeks vengeance. At the beginning of the novel Bitterwood is introduced through other characters perceptions and the forays in his past. I enjoyed the foray in his past and I liked him as a character, mainly because he is quite human in his selfishness and his actions are not the most moral ones. The story in “Bitterwood” unfolds many layers, follows a number of characters and benefits from a lot of action. Every plot which composes this story draws to a common point towards the end of the novel. Most of the characters are dragons, but I also followed the stories of some of the humans. Although the novel focuses on a great number of characters and stories I didn’t had problems in following all of them, because the author makes this task easier and he doesn’t complicate the story unnecessary. The novel is full of action and the moments when the pace is slowed are few or inexistent. The author mixes for the novel’s action ingredients like intrigue, adventure, revenge, moral issues. Unfortunately the characterization is not the strong point of the novel. Because of its great number the characters, some of them seem to be unfinished and not fully developed. Although some of them are pretty interesting neither of them benefit from of an in depth characterization. I failed to find the use of some of them like Zeeky. Even though I liked this character and his childish behavior she doesn’t seem to play any role in the story. But as the story ends with her I think that she will be developed in a following novel. The same thing happens to Gadreel, a slave dragon, who doesn’t seem to have a specific role. I would have liked to see other characters developed, like Vendevorex, Metron and even Bitterwood. The ideas behind the world building are very interesting and I really like those. I will not reveal much here because it will spoil your read, but I will say that the concept is interesting and intriguing. With elements of science fiction added on the fantasy background the general idea sets the imagination on fire. I also liked the dragon society, with social structure, with three different species of dragons every one of them with a specific role and its own characteristics. Unfortunately like the characterization the world building is not developed in full either. The idea and the mystery around her is touched only on basis and it left me a little disappointed by her underdevelopment and left my imagination ablaze. 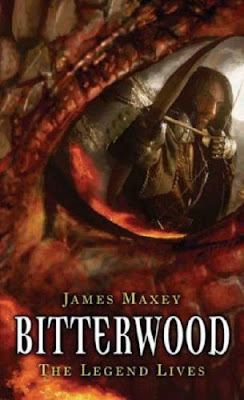 James Maxey’s ideas behind the world building, the fast pace of the novel and the action make of “Bitterwood” an enjoyable read and despite its flaws is an entertaining fantasy adventure.